Coil damage during handling and storage has become an increasingly expensive/costly burden for steel and specialty metal producers and service centers. Today's manufacturers must overcome a number of obstacles to produce a quality product on-time and within budget. If you're experiencing problems with coil or sheet damage, Universal Urethane can help. We offer economical solutions that can be easily implemented. Protect your surface critical metals with high performance urethane floor pads and coil protectors from Universal Urethane. With proper installation and use, coil handling protection safeguards against product damage and can help reduce waste. Backstop Pads: Universal Urethane can make several styles of backstop pads for cut to length lines. We make basic pads that will handle the cut metal being bounced off of it. We can also attach a thick foam rubber backing to our backstop pads which absorb some of the force of the cut sheet. Coil Cart Pads: Universal Urethane can make any size and shape of coil cart pad. Pads can be roughed up and groove patterns added to increase grip in oily applications. Coil cart pads can be made with bent or rolled steel backing to fit all different size coil carts. 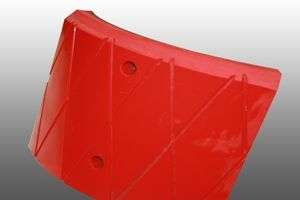 Crane Bumpers: Universal Urethane can supply new crane bumpers complete with metal plate, or we can refurbish used metal crane bumpers by removing old urethane from base plate and recovering. Our crane bumpers are furnished with safety cable attachments and safety plate designed to keep the urethane stuck to the metal base plate. We have a variety of molds varying from all of the round bumper sizes to custom made rectangular and tapered bumpers. spot welding. Any area of the tine can be covered. Tine boots can also be made designed to slide on and off of the tine. Lifting Boots: Universal Urethane makes a variety of lifting boot covers. We can easily fit our urethane to match the outline of your lifting boot. We have several materials for higher temperature, abusive/harsh environments, and standard coils. We can also coat lifting hooks in house or with pads and boots. Ram Tractor Boots: Universal urethane will come on site and measure your ram tractor to be fit with a custom made boot. The boot will provide protection when lifting coils and when inserting ram into coil id. Turnstile Pads: Metal turnstiles can leave a crease on the inside of softer coils. Universal Urethane can make a removable plate with soft urethane bonded on it to be fit over a turnstile arm. This pad will not mark the inside of coils. It also offers extra grip on the coil to prevent slippage and possible telescoping of a wound coil. 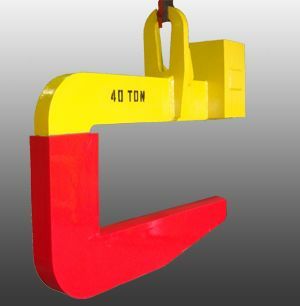 Urethane C-Hook Covers: Universal Urethane can provide several options for C-hook protection. We will measure your C-hook and supply pads with steel backing. These pads can be attached by countersunk bolt holes or by spot welding to the hook. By using this method of covering your hook you can choose areas that need to be protected and only replace these areas when the pad wears out.